Finally! I've been shooting SUP ripper Sean Poynter and other SUP riders for the past six months or so and... we've finally made it into the mag! A sick layback cutback photo of Sean is my first published SUP photo ever. I don't have the actual shot from the magazine but as soon as I get my hands on the most recent Standup Journal, I'll take a snapshot and get here asap. I have the original on file but it just looks better in print. 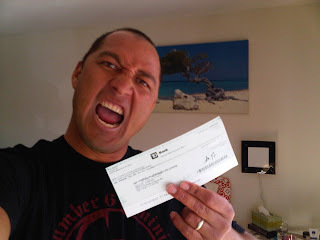 For now, here's a pic of me with the goods... a check to be cashed! Stoked. Straight to the bank! Thanks Clay and crew at Standup Journal. Great photog support over there!